The incoming Democratic governor made a personal appeal to his GOP predecessor. Accusations of a blatant power grab, personal appeals from the incoming Democratic governor to his Republican predecessor, protesters marching on the State Capitol, the ongoing situation unfolding in the state of Wisconsin has all the hallmarks of a classic political drama. Now, with a deadline to sign the bills into law fast approaching, Democrats in the state are ramping up their pressure campaign on outgoing Republican Gov. Scott Walker, hoping he will heed calls not to make a series of bills stripping incoming Democratic Gov. Tony Evers and other statewide elected officials of an array of consequential powers. 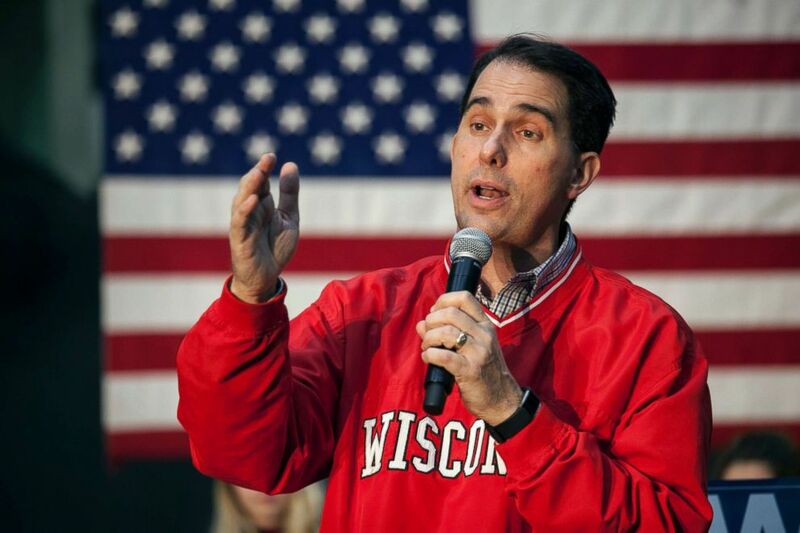 But this week Walker signaled the clearest sign yet that he is dug in on support for the bill, despite national blowback and rebukes from some in his own party, including former Wisconsin Republican Gov. Scott McCallum. "It appears completely political, [like] a power grab," McCallum said in a recent interview with the Milwaukee Journal-Sentinel. (Darren Hauck/Getty Images) Governor Scott Walker speaks to supporters at a last minute get out the vote rally the night before the midterm elections at the Weldall Mfg., Inc., Nov. 5, 2018, in Waukesha, Wis. In a statement released Tuesday, Walker defended the legislation, which would limit the governor's power over several state agencies and prevent the state's newly elected Democratic attorney general from pulling out of a lawsuit challenging the Affordable Care Act, saying Evers will still maintain some of the strongest powers of any governor in the country. "Let’s set the record straight -– the new governor will still have some of the strongest powers of any governor in the nation if these bills become law," Walker wrote, "He will have the power to veto legislation and he will have some of the broadest line-item veto authority of any governor in the nation." Evers defeated Walker, who was seeking a third term to the governor's office in the Badger State, by a margin of just over 30,000 votes last month, while Democrats simultaneously swept elections for all statewide offices, including attorney general and state treasurer. The Democrat said over the weekend that he has spoken with Walker about a potential veto, but that his predecessor was "noncommittal" during those talks. "I'm not particularly encouraged at this point in time," Evers said in an interview on NBC's Meet the Press, "But it's around Scott Walker's legacy. He has the opportunity to change us and validate the will of the people that voted on Nov. 6." 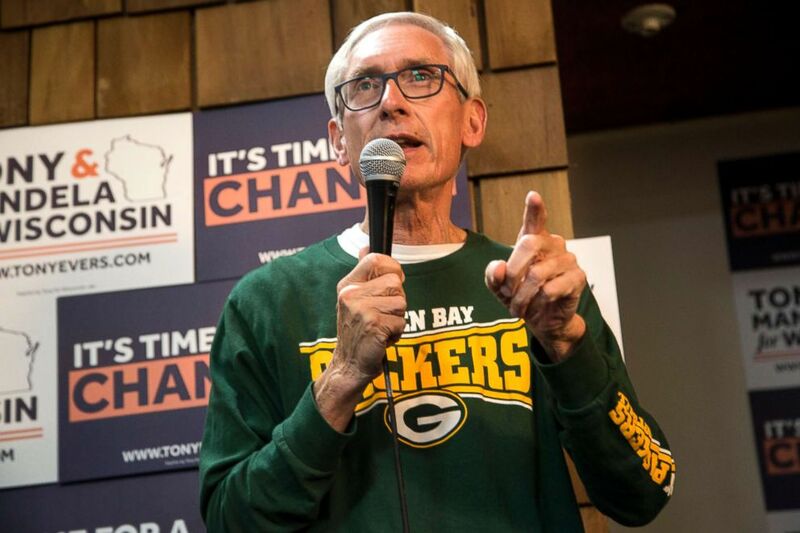 (Darren Hauck/Getty Images) Wisconsin Governor Tony Evers speaks to supporters as he makes a campaign stop at the Coordinated Campaign southside office, Nov. 4, 2018, in Milwaukee. Walker's office confirmed to ABC News that he has not yet received the bills passed by the state legislature during the lame-duck session. The governor has not yet called for the bills to be delivered, but the legislation will automatically be sent to his desk by the chief clerk of the Wisconsin State Senate on Dec. 20. He then has six days from that point, excluding Sunday, to either sign the legislation into law, veto the legislation or not sign it and have it automatically become law. That means the latest the bill could become law would be Dec. 27th. The episode continues to raise questions about the acceptability of partisan responses to election losses, and a potentially destabilizing precedent set by this and a similar situation playing out across the lake in the state of Michigan, where the Republican-controlled House and Senate are seeking to limit the power of incoming Democratic state officials, including Gov.-elect Gretchen Whitmer. "This really is shocking, and it really is profoundly to the central, democratic norm, which is when one side loses power, they turn over power peacefully," said Kenneth Mayer, a professor of American politics at the University of Wisconsin. "If is how it’s going to work from here on out, that is just really unhealthy for democratic stability." The situations in Michigan and Wisconsin are reminiscent of a 2016 attempt by the GOP-led state legislature in North Carolina to limit the powers of an incoming Democratic governor. The courts eventually ruled that the legislation violated the state's constitution. But if the efforts in Wisconsin and other states are ultimately successful, the worry becomes a fundamental shift in the allowable terms of political warfare in the wake of defeat. "You don’t want to bring a Nerf gun to a knife fight. If one player is violating norms and the other player says well I’m still going to behave as if they still exist, then you’re at a real disadvantage," Mayer said, "Over time, if voters are OK with that, or in a position where they can’t respond, then you have serious questions about the meaning of democratic rule." 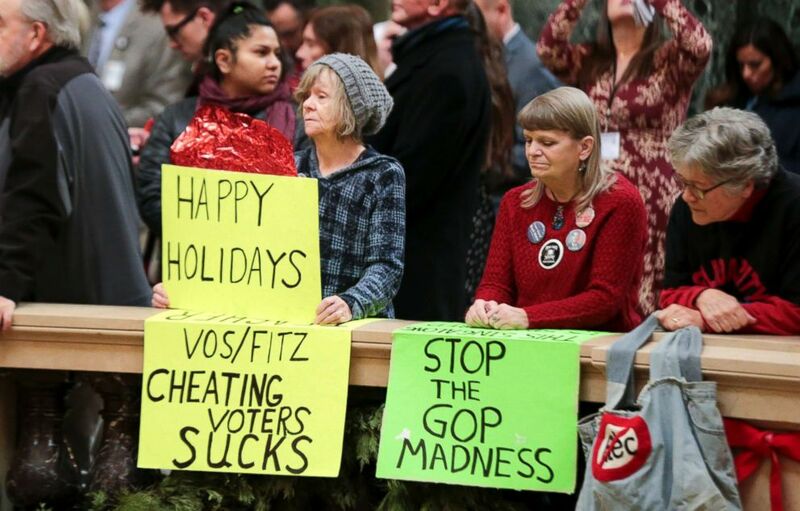 (Steve Apps/Wisconsin State Journal/AP) Protesters Peppi Elder, left, and Christine Taylor holds up signs during the state Christmas Tree lighting ceremony in state Capitol Rotunda, Dec. 4, 2018, in Madison, Wis.
Republican leaders in the state have fervently defended the legislation, claiming the firestorm of the last few weeks is the result of hyperbolic rhetoric from Democrats and the news media. "The extraordinary session of the state legislature was not a 'coup' or a 'power grab,'" Robin Vos, the Republican speaker of the Wisconsin State Assembly, wrote in an op-ed this week defending his party's actions. "The extraordinary session was merely an effort to ensure that in divided government, every branch of government has an equal seat at the table." Top Democrats in the state say they are hopeful they can mount a pressure campaign strong enough to influence Walker. "We’re hoping that the pressure from other Wisconsinites, Democrats, Republicans, Independents, Libertarians, whoever will cause him to back down. Because this will be his legacy," Wisconsin Democratic Party chairwoman Martha Laning told ABC News in a phone interview. Evers and other Democrats in the state have said legal action is one of many options "on the table," but that they are waiting for a final decision from Walker before proceeding in that direction. "We’re all looking at what the precedent is out there and what’s happened before," Laning said, "And we’re ready to do whatever is necessary to protect our democracy." The episode all but ensures a bitter brawl in the Badger State come 2020 when control of the state legislature is at stake and it returns to its status as a key presidential battleground. Democrats say in 2020 that they won't let voters forget what happened in 2018. "We will bring this back to light to let people know that Republicans did not accept the word of the people and it’s time to replace them and be sure that we get leadership that voters choice," Laning said.